Welcome to KSEB Online Bill Payment. Here, you can read detailed instructions to view your KSEB electricity bill and to make KSEB online bill payment using multiple methods. Our motto is to encourage and to make people capable to use online services instead of standing in long queues. We are not related to Kerala State Electricity Board or any other government agencies. We seek no profit from providing these services. Kerala State Electricity Board has introduced their online portal to make KSEB online bill payment. You can make KSEB online bill payment using this portal with or without registering. The advantage of paying after registering is , you don’t have to need your bill number every time. If you are registered and your details are added, each time your outstanding amount will be displayed automatically. Otherwise you have to look for your outstanding bill number everytime for making KSEB online bill payment. Obtaining outstanding bill number is not a big deal though. If you have the hard copy of your electricity bill, you can obtain the bill number from the hard copy. Otherwise it can be obtained from KSEB Bill View page by entering your KSEB 13 digit consumer number and your electrical section. 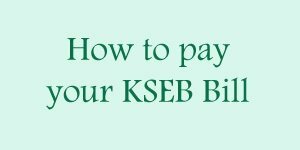 If you have access to the Internet and you have any of the payment methods like credit/debit cards,Internet Banking etc in hand, then it is so easy to pay KSEB bills. There is no need to stand in long queues to wait for your turn to come to pay your KSEB bill. 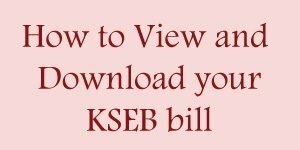 There are more than one ways to make KSEB online bill payment. You can pay your KSEB electricity bills without registration using KSEB Quick Pay or KSEB Oruma, the same can be done with registration using KSEB payment portal also. Follow the links on the top and bottom of the page to read detailed instructions to view and pay your KSEB electricity bill (KSEB LT Bill).